The Washington State Supreme Court ruled on Friday that the citizen-passed initiative creating charter schools, allowing such schools to divert tax dollars from public schools to these schools, violates the state constitution: Late Friday surprise: Supreme Court says charter schools initiative is unconstitutional. What’s worse, the charter schools get to exclude students who are difficult to teach. Public schools have to accept everyone. By excluding the more difficult students, the charter schools should have better outcomes just because they start with students more likely to be successful. Since that have significantly worse outcomes despite this advantage, that means they’re even worse at education than the statistics would have you believe. Charter schools don’t work better than public schools, and they don’t even work as well as public schools. And they are stealing money from the public schools that are doing a better job (not perfect, but provably better) to do it. … Kim Davis posed a great threat to the religious liberties of our nation by refusing to carry out her duties as an agent of the state, issuing marriage licenses to all couples, regardless of their sexuality or gender identity. Davis forced her Christian faith on the people of Rowan County, and violated their right to be able to receive equal treatment from the government, regardless of their sexuality, race, religion, or values. If Davis was able to continue serving as the county clerk, she could, in theory, continue to refuse to grant marriages licenses or provide services to everyone she disagrees with, which would, in effect, completely dissolve the religious freedoms of the people in her county. Yes, Davis has been divorced three times and is on her fourth marriage, Hemingway concedes, but not one Davis divorces “[took] place within the time period she was Christian.” It’s a miracle: Davis hasn’t divorced anyone since becoming a Christian. So it’s not fair and totally uncool for people to bring up Davis’s own not-the-least-bit-biblical marital history. Davis isn’t one of those “screw as I say, not as I screw” conservatives… because she wasn’t a Christian back when she was marrying and cheating and divorcing and marrying and divorcing and cheating and marrying and divorcing. So what was Kim Davis back then? Was she a Zoroastrian? Was she a Rastafarian? Was she a Rosicrucian? 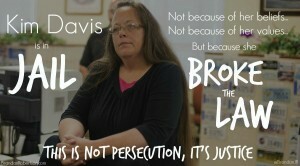 Kim Davis was a f–ing Baptist. Her first three marriages were performed in a Baptist Church of which she was a member. Her first three marriage licenses (issued by the county) were signed by a Baptist minister. I was raised Baptist. You do not become a member of a Baptist Church until you make a declaration of faith, said declaration is accepted by the congregation (“all in favor signify by saying ‘Amen'”), and being Baptized into the faith (or providing proof that you had been Baptized in another Baptist church). That acceptance from the congregation is required, in part, because Baptists don’t believe it is right to Baptise children who are too young to understand what they are doing. The congregation is collectively saying they believe your declaration is sincere. So Davis’ defenders who are claiming she wasn’t Christian back when she was doing all this stuff that is actually explicitly prohibited by the same Jesus she claims told her not to issue civil marriage licenses to gay couples are essentially claiming that Baptists aren’t Christian. If the words of Jesus are a legitimate reason to withhold a marriage certificate from a pair of consenting adults, than Kim Davis should not have received her second, third, and fourth licenses. If the argument is that a later “cleansing by the blood of Christ” makes all of that okay, then logically it is wrong to withhold the licenses from otherwise legally qualified people because who can say whether or not they may have an epiphany and a literal “come to Jesus” moment later?